Do you have a cracked window somewhere in your home? If so, your first inclination might be to blame your kids, your spouse, a neighbor or a roommate for it. After all, if a window breaks, there has to be someone to blame for it, right? That’s not necessarily always the case. Many people don’t realize this, but there are actually three main ways that windows can crack. While human error is to blame at times, there are also other factors that can cause a cracked window without any human intervention. Let’s take a closer look at the three types of window cracks and how each of them occurs. Stress cracks often start small, forming near the edges of windows and then gradually growing larger over time. They can be caused by closing a window too firmly or by a loose window sliding in the frame and accidentally falling too quickly. For the most part, however, stress cracks are tied closely to the temperature both inside and outside of your home. If you heat your home up dramatically as the outside temperature drops, it can cause stress cracks to take place. The opposite is also true, so if it’s colder in your home from air conditioning and temperatures outside rise dramatically, a crack can also form. Once the window is cracked, it will only get worse as you move forward, which makes window repair or replacement essential to preventing a fully broken window. Pressure cracks aren’t very common, and they typically occur in either insulated glass or double-paned windows that have been installed at very high or very low elevations. It’s also possible that pressure cracks can form in situations where there are dramatic changes in pressure, such as an office building that’s pressurized or in an extreme change in air pressure from a high-powered storm. These cracks will often appear curved instead of straight, and most often require a full window replacement. The final types of cracks, impact cracks, are the ones that people are most familiar with. These cracks occur when an object comes into contact with a window. In some cases, they will cause small cracks around the impact site that can be repaired without much effort. However, many impacts will shatter windows completely or cause irreparable damage. If you have a window with an impact crack, you should not try to remove the window yourself. 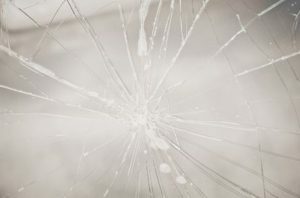 As you try taking it out of the frame, the weakened glass could completely shatter, possibly hurting yourself or causing more damage in the process. No matter what kind of window crack you may have, the professionals at Affordable Glass & Mirror can come to your home or business today and help. We can repair or replace your cracked glass quickly and affordably, allowing you to rest easier and enjoy your windows without worrying about the fractures or cracks that could lead to further damage. Let us take a look and help with your windows by giving us a call at 404-361-5151 to schedule an appointment today.